Ladies and gentlemen, I hang my head in shame. I don’t know how long Dim Sum Garden has been around, but I know I’ve passed the place dozens of times without giving it a second thought. And can you blame me? It’s literally in an underpass and next to the scary chinatown bus station. It’s not exactly what I consider location, location, location. As far as locations go, it’s positively unsavory. And the place itself also is partially to blame. It’s completely uninviting and has tons of neon signs. And they have pictures of their supposed dishes on the walls at the counter, you know, like the ones you see at your neighborhood shady chinese takeout joint. But I finally saw the light and am now a believer. I found out that this place had soup dumplings, so I had to go and try it. Damn, we went gaga over these. I can’t believe I’ve gone this long without ever having had a soup dumpling. There’s meat and stuffing inside, but there’s also some soupy liquid too, and that’s the beauty of it. You’re supposed to put a little hole in it with your teeth so the inside can cool off a bit. Then you’re supposed to sip the soup from it a little at a time. Oh who cares what you’re supposed to do. You’ll figure out how to eat it, and you won’t want to stop. There are a few options of sauce that come on every table. 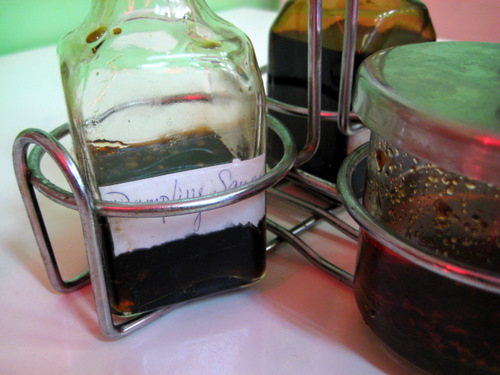 The one that is crudely labeled as “Dumpling Sauce”, that’s the one to go for. I think I could drink this plain if I had to. 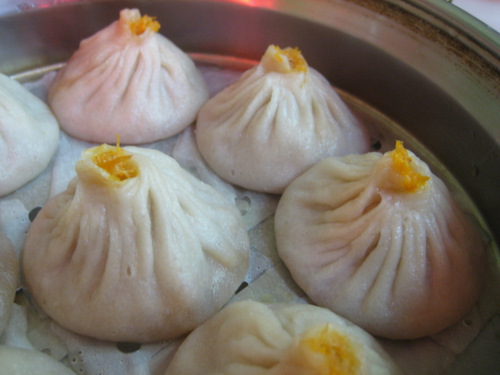 But it’s absolutely divine with any of the dumplings. It’s sweet and savory. The other one tasted like it had turned. And there’s also some hot chili oil if you like things a bit spicier. 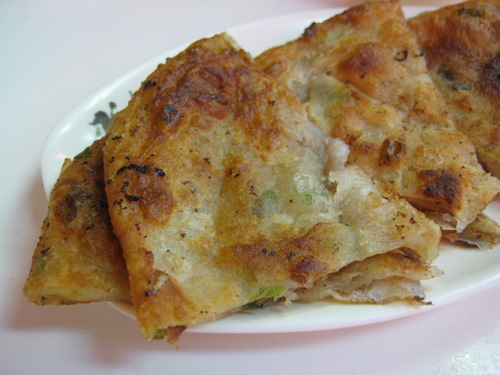 The scallion pancakes. These are pretty good, but they are a little bit greasy. 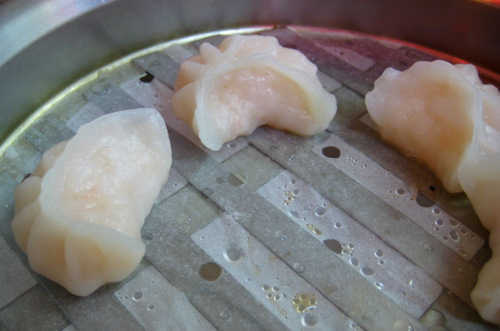 The shrimp dumplings. So simple, so pretty, so delicious. And these are probably somewhat healthy too. 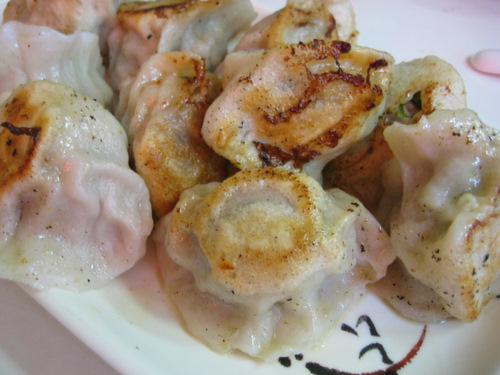 These are the pan fried pork and chive dumplings. You know, because sometimes, steamed is simply not enough. You want a bit of the extra grease and the crunchy char of a pan fry. These little puppies were good too. But one of our favorite dishes of the night was the beef brisket noodles. 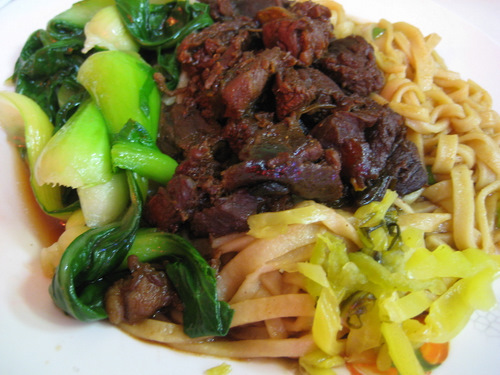 There are thick egg noodles and a healthy helping of baby bok choy. And then there’s a heap of beef brisket. Ooh yeah baby. And everything was drenched in a chinese five spice laden sauce. I’m not the biggest chinese five spice fan, but it totally worked here. It worked so well that I wanted to eat all of this but on top of the dumplings, my belly just was not having it. But I did enjoy the little leftovers the next day. I heard that Dim Sum Garden had good noodles too, and darn it, I heard right. In fact, they have good everything. So please, pretty please, don’t let the sketchy location or the uninviting flourescent lighting ambiance deter you. Go! And eat! And enjoy! And be amused by the strangely androgynous server. You’ll be scratching your head too!